IPRA released video Wednesday from the shooting death of Joshua Beal by an off-duty police officer. MOUNT GREENWOOD — Videos and 911 calls paint a picture of the frantic atmosphere in Mount Greenwood just ahead of the fatal shooting of Joshua Beal by a pair off-duty police officers. Three videos, 31 audio files and eight different police reports from the Nov. 5 shooting were released late Wednesday. The shooting happened shortly after a large fight erupted at 111th and Troy streets — just outside of a fire station in Mount Greenwood. Two of the videos show the melee ahead of the shooting, and shots can be heard in an accompanying video. The 911 tapes are filled with the frightened voices of Beal's family and other bystanders, several of whom were attending a baby shower across the street at Joseph's Restaurant and Bar. One of the voices on the tapes is that of an off-duty police officer who happened upon the scene and said he was "encircled by two cars of people." "These mother-------s," the caller tells the operator. "You need to send the police to 111th and Troy right now before someone gets shot." The call ends as the 911 operator asks the upset officer if his weapon is drawn. The officer does not answer. Police later said the other cars involved were leaving a nearby funeral, which is backed up by several 911 tapes. According to police, an off-duty firefighter told the drivers they were blocking a fire lane. 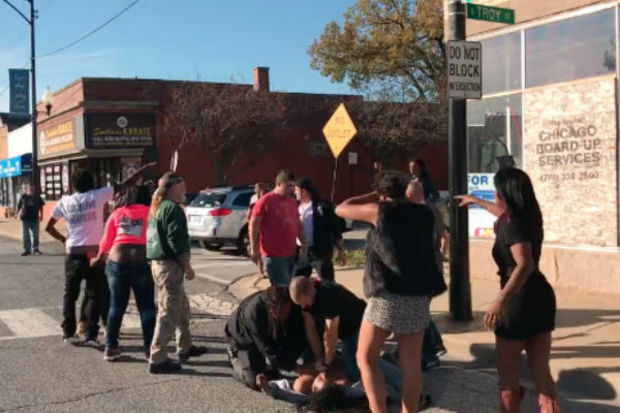 A fight ensued, and a police sergeant on his way to work at the Morgan Park District also took notice of the brawl that had moved into the street. Police said the sergeant got out of his car, took out his gun and identified himself as a police officer. But the "incident continued to escalate." A still shot released from one of the videos shows what appears to be Beal pointing a gun at police officers on the scene. The sergeant then shot Beal "multiple times," police said. According to the documents released by the Independent Police Review Authority, the sergeant fired his weapon seven times. The other police officer on the scene fired 11 times. Beal was 10-15 feet away from the officers when he was shot in the abdomen, back, chest, groin, shoulder and thigh. He also had graze wounds on his forearm and head, the reports state. All Chicago police officers involved in a shooting are required to work 30 days in the office as part of a mandated administrative duty. The sergeant involved in the shooting has since returned to his regular job, a police spokeswoman said Thursday. The status of the officer involved in the Mount Greenwood shooting is unknown. Another call released Wednesday is from Beal's sister, who sobs and tells the operator that "they just shot my brother." She said he was in the street and not breathing, and could be heard telling someone on the scene to "get away from my brother." In a video, a man in a red shirt — who other 911 callers say was the shooter — is seen trying to approach an unresponsive Beal as another man gives him CPR in the street. People on the scene, possibly Beal's family members, point to the man in the red shirt and attempt to get him away from the dying man. Kofi Ademola is a community organizer with Black Lives Matter Chicago and has been in regular contact with the Beal family since the fatal shooting. He had not spoken to the family Thursday but reached out to offer some encouragement during this difficult time. Ademola said the family was already grieving when Beal was fatally shot. And now they are dealing with the arrest of Beal's brother Michael, who was taken into custody following the shooting for allegedly tackling with the officer and attempting to grab his gun. For Ademola, what stood out among the new information was the 911 call from the officer. He said the officer's tone backs up the family's claims that painted the officer as both "aggressive" and "antagonistic." The officer "was there to display dominance," Ademola said. "We have a police culture in general — especially with CPD — that shows disdain for people's civil rights." The shooting led to multiple protests in the Far Southwest Side neighborhood. Black protesters decrying the death of Beal said they faced what they called '60s-style racism in the neighborhood. Protests went on for weeks, but slowed after some Black Lives Matter and Blue Lives Matter activists came together for a dinner and prayer vigil. The shooting stirred up racial tensions in the typically quiet neighborhood, which has seen its share of racial strife. Log #1082890 – 3rd Party Video #1 from IPRA Chicago on Vimeo. Log #1082890 – 3rd Party Video #2 from IPRA Chicago on Vimeo. Log #1082890 – 3rd Party Video #3 from IPRA Chicago on Vimeo.